In this third session of the 2018 residency for new collaborations, NURTUREart is pleased to host Sewing Room: Hands On Black Freedom by artist Clarivel Ruiz and writer Jazorink. Working to resist media and cultural messages that devalue Black and Latinidad character, ethnicity, and culture, Ruiz began sending Black Dolls to young women in the Dominican Republic and Haiti in December 2017. In the Spring of 2018 she held workshops with Dominican and Haitian women to hand-make over forty Black Dolls to ship to the Mariposa Foundation in the Dominican Republic to distribute to local young women. 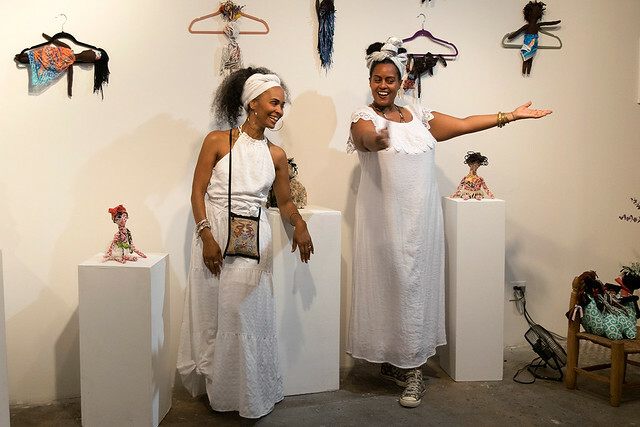 As part of their residency at NURTUREart, Ruiz and Jazorink will host a number of workshops for people from Haiti and the Dominican Republic to gather, create Black Dolls, and discuss race, discrimination, gender, sexuality, liberation, and decolonization. We, daughter from the land called Kiskeya Ayiti Bohio (aka Hispaniola aka Dominican Republic and Haiti), a land colonized but never conquered, raised in New York City on the ancestral bones and covered shrines of the Lenape people. Our artist practice delves into understanding the historical myths that have been created to subvert and oppress people of color and to heal wounds created by racial divides. Merging various arts forms to unravel the destruction created by colonialism. In 2016 we initiated a project called Dominicans Love Haitians Movement bringing together Dominican and Haitians to celebrate our commonalities. Through this project we were accepted into Culture Push’s Utopian Fellowship and the 2017 cohort of Hemispheric Institute’s EmergeNYC program to further develop ourselves as an artist’s activist. In 2016 we became part of the Black Women Artists for Black Lives Matters performance group that developed work for Simon Lee’s gallery exhibit at the New Museum and in 2017, Brooklyn Museum’s closing event We Wanted A Revolution: Black Radical Women 1965–1985 and Art In Odd Places: Sense exhibit. In 2018, we are part of Betty’s Daughter Arts Collaborative as Associate Artist, Art In Odd Places, Body! exhibit and an NEA recipient for Dominicans Love Haitians Movement. As part of further developing Dominicans Love Haitians Movement, we have raised over $2,000 in donated black dolls that have been sent to Haiti and hand crafted dolls sent to The Mariposa Foundation, Dominican Republic. Our work continues to be to decolonize our ancestral lands. Pen named Jazorink, Joyce writes from a place of self-reflection, redemption and testimony advocating for self-truths and self-empowerment. A creative writer who expresses life and leadership through words, Joyce (Ayo) Azor is no stranger to the world of music and performing arts. Daughter of disco diva Lucy Martin, formerly of the legendary group CHIC; creative writing, singing and performing have always been a foundation of what fuels and pushes her forward. Joyce’s talents have afforded her the opportunity of working with platinum artists such as Hip Hop’s first ladies, Salt & Pepa, and landing a Hip Hop Recording contract of her own in the early 90’s. Choosing family, she stepped back, never loosing her purpose of creativity, performance and giving back. Jazorink, passionately pushes the next generation into finding their life’s positional purpose alongside her husband, they are the creative minds behind Runway Haiti (circa 2011) and Ayiti Deploge (circa 2008), which develops platforms where music and fashion bridge the gap between established Haitian artists and aspiring brilliant musicians, beautiful models, and talented designers. Why Haiti? “Haiti has always whispered a soft sound of resilience and untapped beauty! It is important that the world sees a different side of Haiti, the beauty of the culture and its people. I didn’t choose Haiti! Haiti chose me!” Currently, Joyce (Ayo) is also the owner of ALCHEMBODY, a place where custom blended essential oils, spiritual oils, and fragrances reconnects and rebalances emotional wellness, supports increasing consciousness through the ase of the herbs, plants, and the hands that create them. You can find her performing spoken word pieces in NYC or abroad, hosting musical performances and continuing to hone her creativity and producing various cultural and art platforms in the United States and Haiti.